Where Gold was First Recorded! In 1799, 12 year-old Conrad Reed made the first documented gold find near Charlotte, in Cabarrus County. 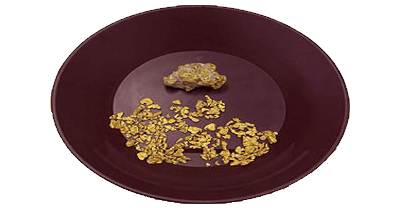 Soon thereafter, everyone from farmers to investors began to pan for gold. It didn't take long to create some 300 mines, employing locals and immigrants from South America and Europe. As time passed, North Carolina became the only producer of domestic gold between 1804 and 1828. 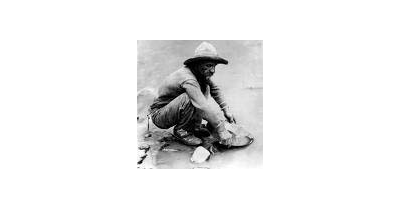 North Carolina was the highest gold producer in the nation, until 1848 when gold was discovered in California. While there are plenty of stories and tales surrounding this period, the majority of mining activity occurred in the southern area of present day McDowell County, known as Vein Mountain. Some streams and regions employed up to 3,000 workers. Members of McDowell County's "founding families" purchased acreage in the region. The McDowell and Carson families were at the forefront of this era, also sending slaves to work their mines. Some slaves became free men after working those stream beds and mines. Successful miners created the Marion Bullion Company and just over the current county line the Bechtler Mint began operating. Evidence of the two are found today at Historic Carson House in Marion and at the Historic Bechtler House in Rutherfordton. During the 1950s, miners graduated from using earlier tools such as pans, sluice boxes and rocker troughs to implementing hydraulic mining methods. When you visit area recreational mines, more than likely the mine was once a busy, commercial mining site. Today, North Carolinians operate many active commercial mines. Those found in western North Carolina, produce minerals used in electronics and a variety of other technical devices. 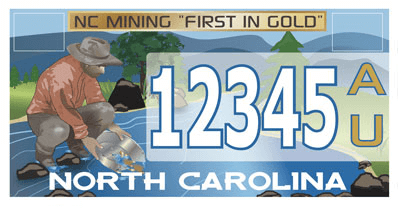 Sign up to be one of the first to receive the new "First in Gold" License Plates!